It’s time for the 7th Leg of the Race and teams will now be flying across the Atlantic Ocean to Madrid, Spain. 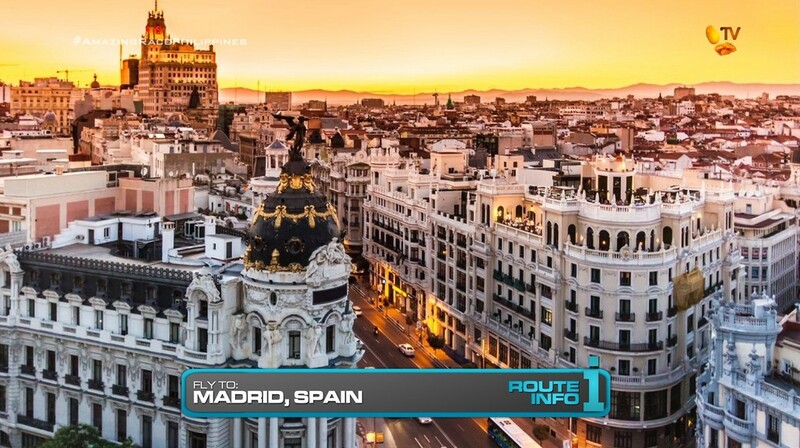 Teams will need to head to the travel agent in Trujillo who will be giving them two flight options via Lima, Peru: Flight 1 on Avianca and Air Europa arrives in Madrid at 5:25am. Flight 2 on Lan Airlines and Iberia arrives at 6:20am. BUT FIRST! 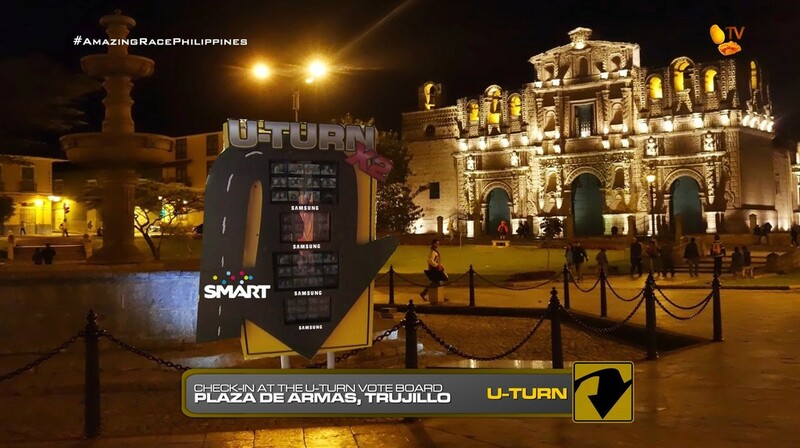 Before teams can leave the Pit Stop, teams must check in at the Forced Double U-Turn Vote Board. 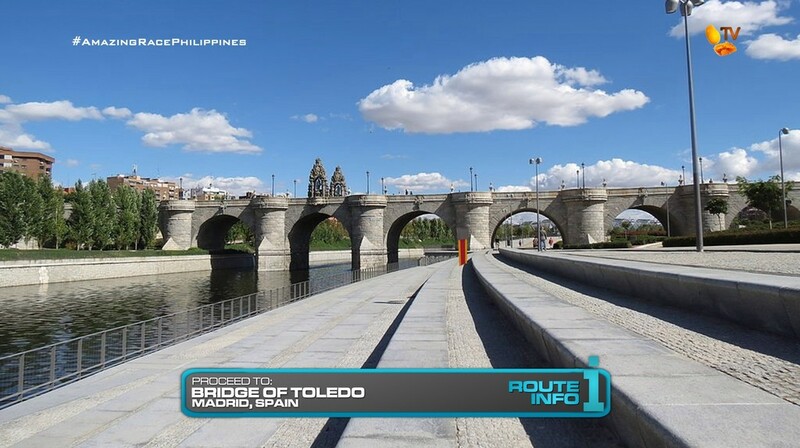 Once in Madrid, teams must take the train from the airport into the city and find the Bridge of Toledo where they must search the area for their next clue. They will find a clue as well as a written note saying “Sopa de Ajo” which they must keep until further notice. 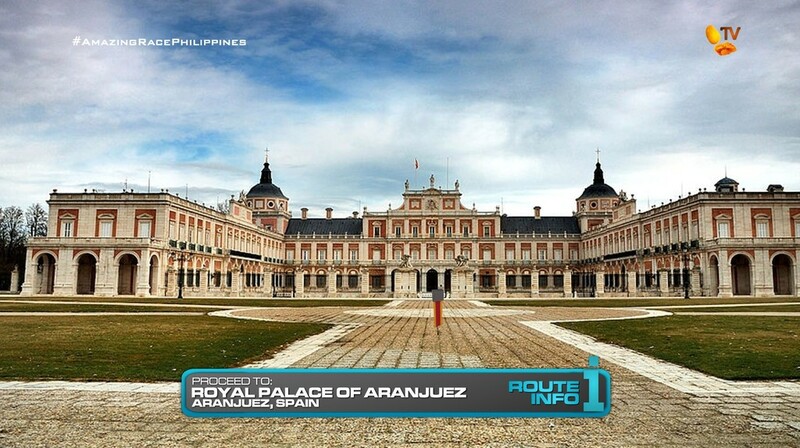 Teams must now make their way by taxi to the Royal Palace of Aranjuez. And here, teams will find the Detour: Take It By the Horns or Tomato Through the Hole. For both Detours, teams must make their way to Constitution Square. 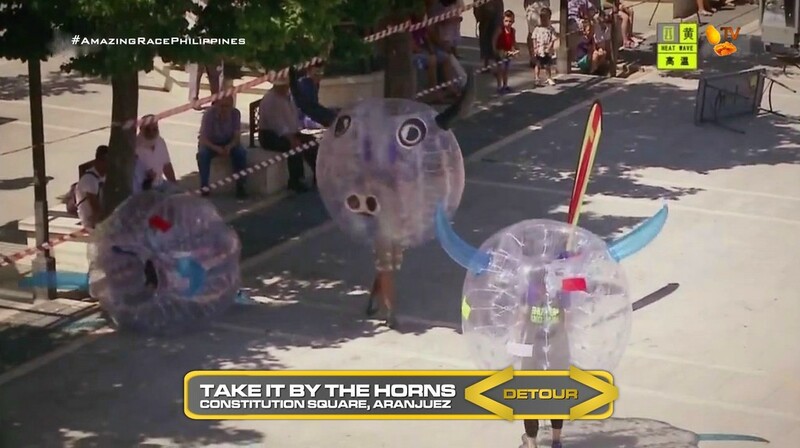 In Take It By The Horns, teams must don bubble bull suits and search the plaza for four different colored stickers which they must correctly match with the stickers on their suits. All while avoiding other bulls trying to ram them. 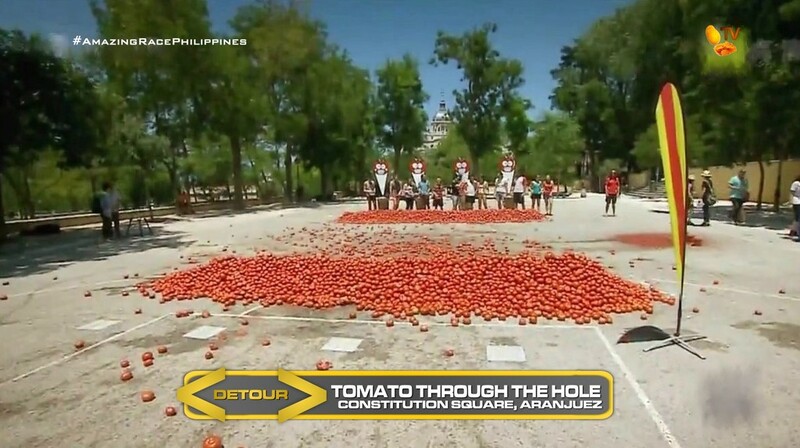 In Tomato Through the Hole, both team members must throw a tomato through a bullseye while being pelted with tomatoes themselves. 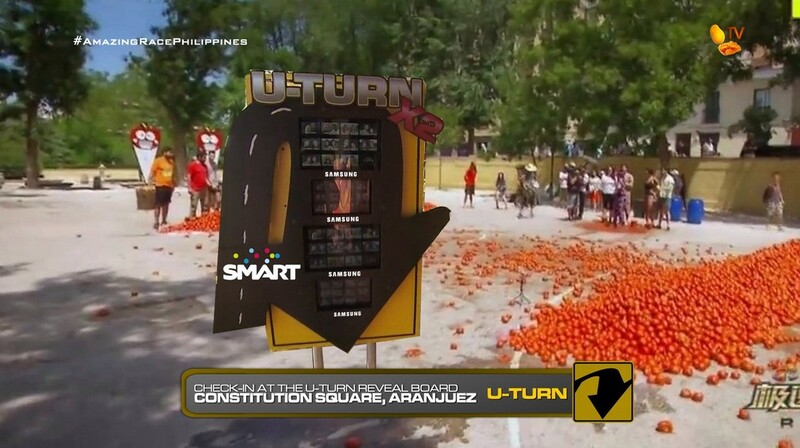 After the Detour, teams must check in at the Double U-Turn Reveal Board. They will then be given a small painting and asked to find the building and plaza named after the artist who painted it. Teams must figure out the painting, “Bullfight,” is by one of the most influential artists of the 20th century, Pablo Picasso. 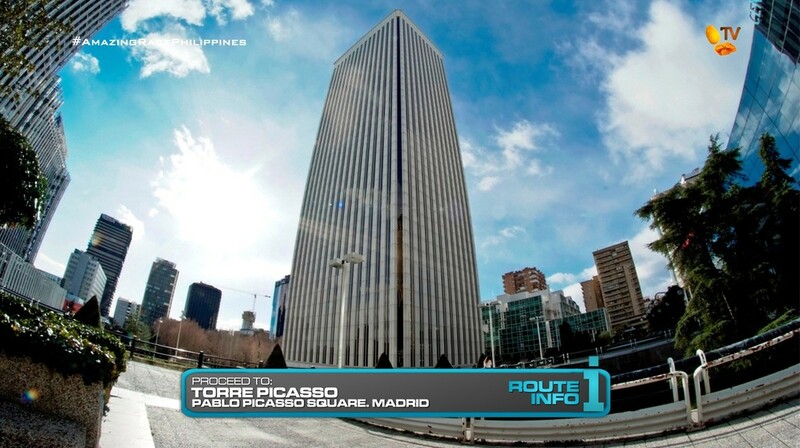 The next clue will be waiting for them in Pablo Picasso Square by Torre Picasso. 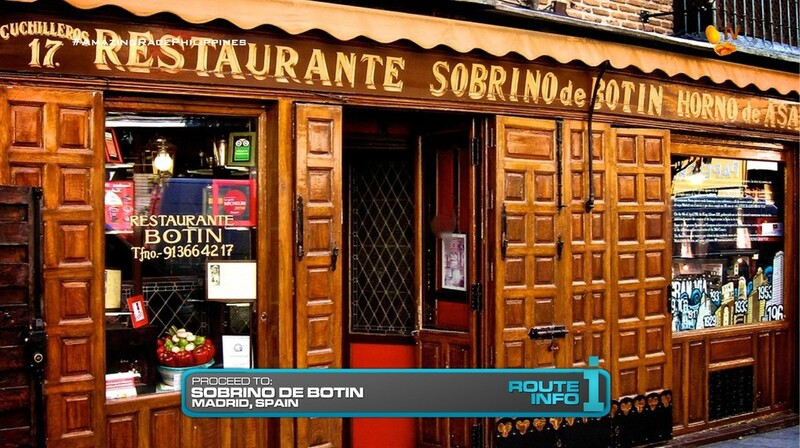 That clue directs teams to find the “Oldest Restaurant in the World” according to the Guinness Book of World Records, Sobrino de Botin. 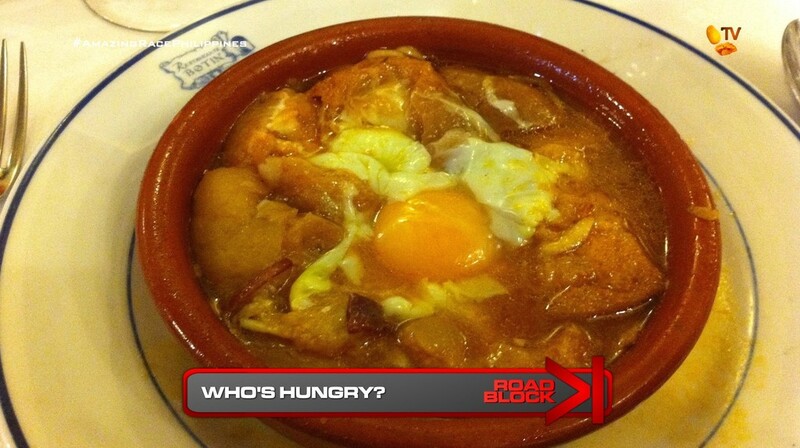 Here, teams will find the Road Block: Who’s hungry? For this Road Block, teams must order a dish and eat it to receive their next clue. But to order the dish, they must hand over the piece of paper they received at the Bridge of Toledo which has the dish written on it: Sopa de Ajo. 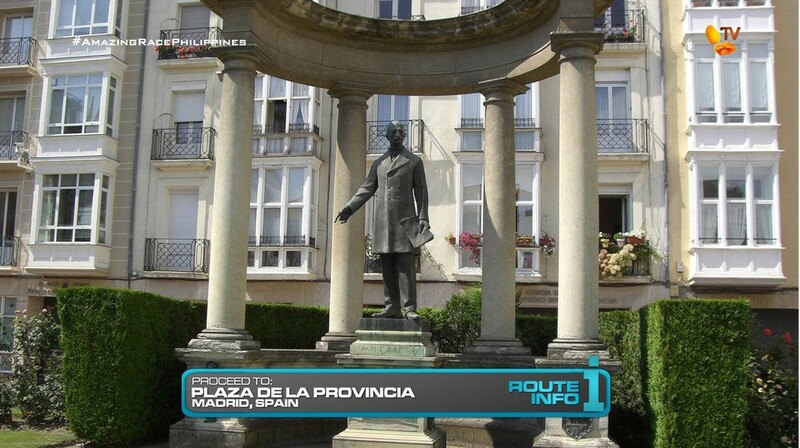 Once the team member has finished their lunch, teams can find their next clue at the Plaza de la Provincia. 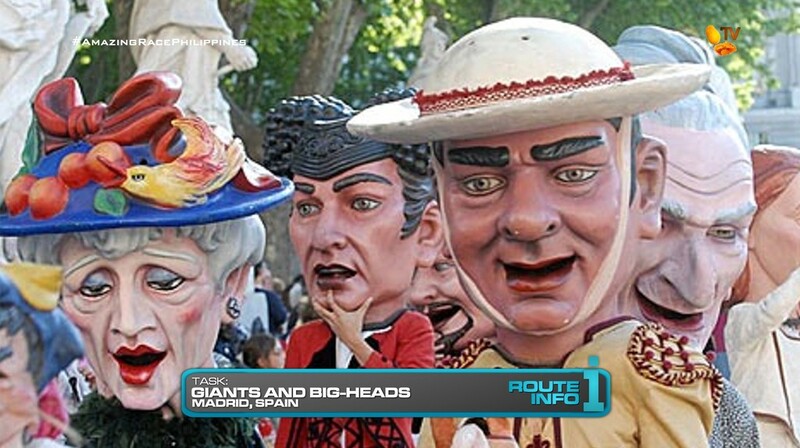 Teams will now be participating in the feast of San Isidro by choosing and putting on costumes representing figures of The Giants and The Bigheads seen during the annual festivities. They will then follow a marked route starting at Plaza de la Provincia and pick up numbered flags on their way to Plaza Mayor. When teams have their all their correct flags, they will be given the next clue which tells them to make their way to the Pit Stop, Las Ventas. Now this should be a very full Leg. First, the train ride should hopefully provide some challenge since this will be their first use of public transportation this season. It also helps with time as teams will be arriving early in the morning. 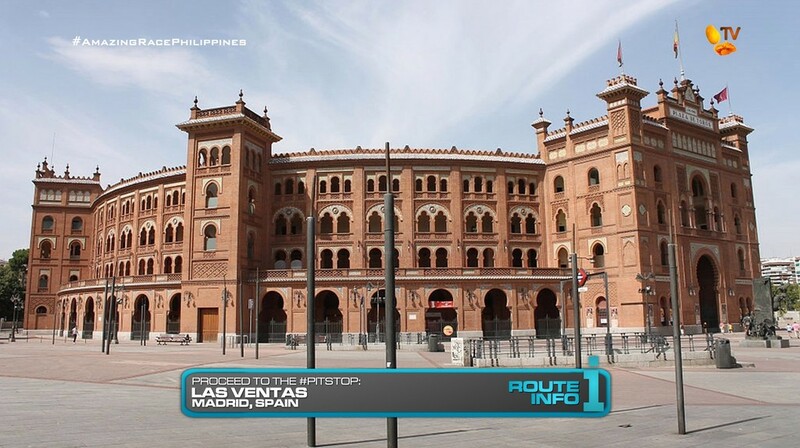 The Detour is recycled from the Madrid Leg of TAR China 2. With the bubble bulls, I think China did it better than TARUS did in TAR24. It also makes it more challenging. And the tomatoes will of course be fun. A future season will make this a Road Block, but it’s a Detour for now here. And since both Detours are good, it’s a perfect place for a forced U-Turn. 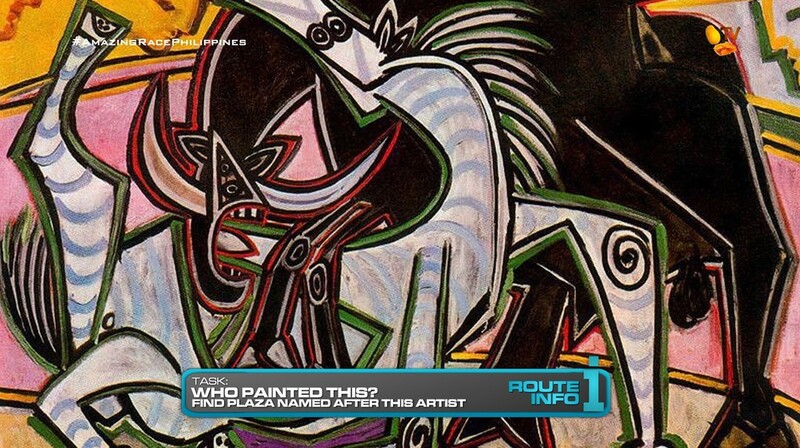 Being in Madrid, the Picasso clue is a nice little challenge. You always want to have teams interacting with locals. The eating Road Block can easily be omitted, but it plays into the “keep until further notice” clue as well as visits a good location. But the highlight of the episode should be the Giants and Bigheads. This hopefully will be a crazy and fun task. And we can only hope most teams will be at this point at the same time to add to the craziness. 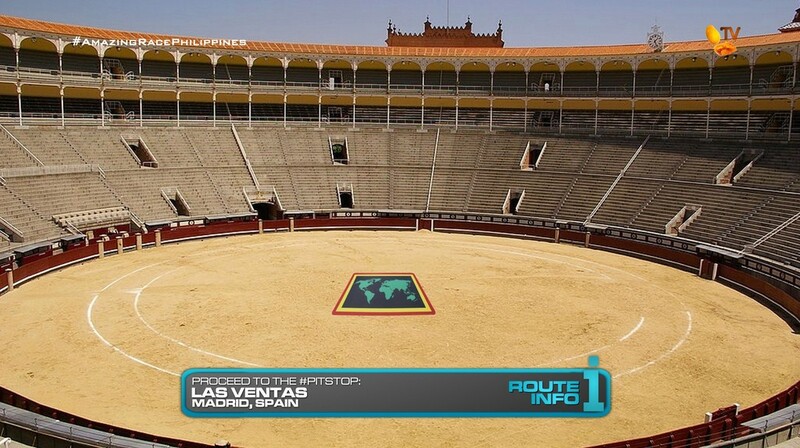 And finally, being in Spain, having the Pit Stop inside a bullring and one as famous as Las Ventas is perfect.